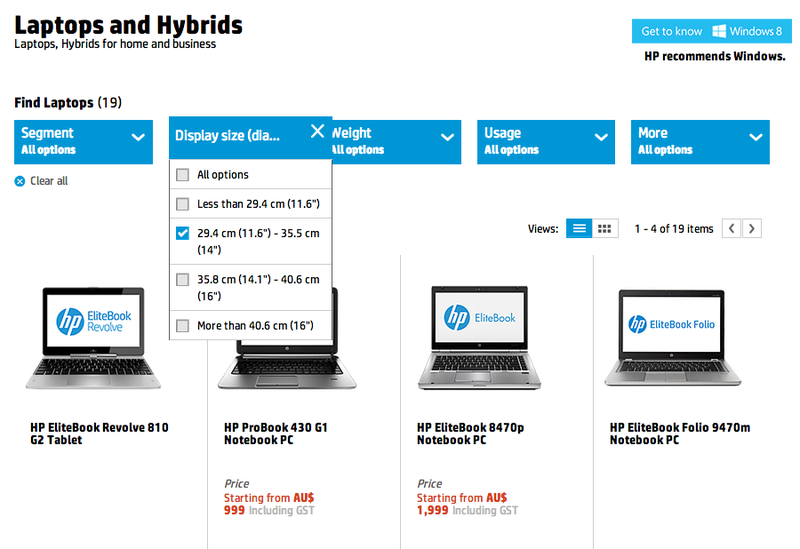 So in the previous ITLT post: “Ultrabook & the latest Intel HD Graphics“, I realised how horrendous laptop product pages can be: hard to find the latest models and sometimes even harder to find their specifications at a glance. 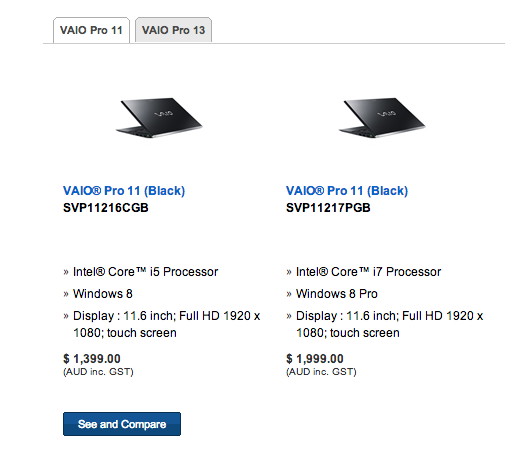 Sony: 1 page showing the 4 different types/segments of notebooks showing screen sizes and start prices. No filtering but the 4 different segments are unique enough that they don’t really need filtering. Each segment shows different models in that segment with processor, screen size & resolution, price. 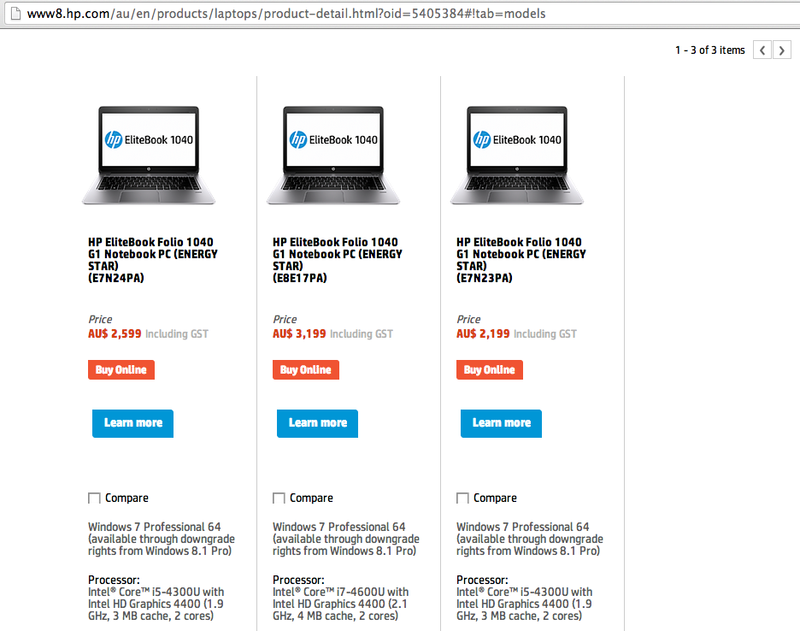 Comparison between models available non obvious page. Dell: 86 results in total but good filtering: checkboxes that work and filterable by 4th gen processor. Results list show OS, Storage, RAM, price. HP: the main page separates devices into “Home” and “Work” which I don’t really like. Results show (screen size and possibly price). Filtering by size shows a checkbox list but it works like an option dropdown – you can select only one. There is no filtering based on processor, so results could be showing you old laptops. Comparison of up to 3 devices to see further specs. 40 devices in total. 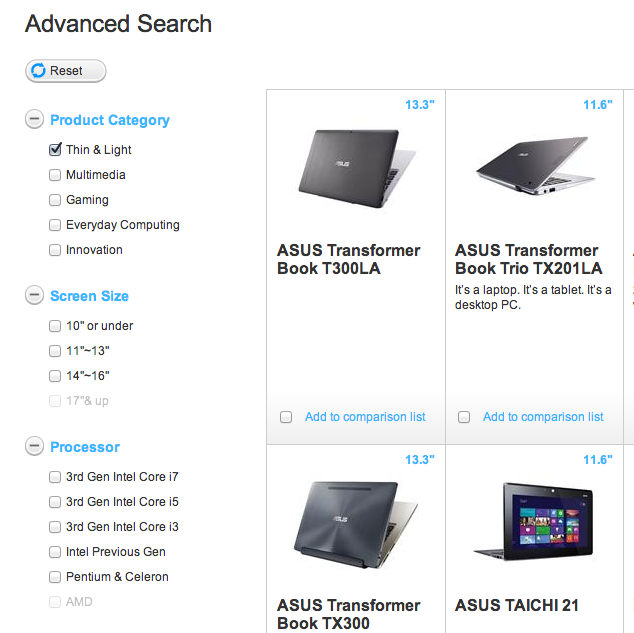 Asus: Nice sidebar filtering options but dismal details of results listing: only shows screen size. Processor filtering does not show 4th gen processors (only 3rd gen and below). UX 301 LA is named as “Ultrabook” but filtering by “Ultrabook” thinness hides it. Can compare models (max 5) to see more specs. 51 results in the “thin and light” category (176 in all categories) – lots of older models. Samsung: Results show only screen size. No filtering and shows a lot of older models. 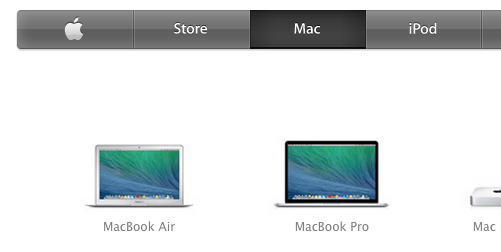 Same model of different colour listed as a separate item – meaning there are duplicates. Viewing all shows all 187 results (lots of old models). 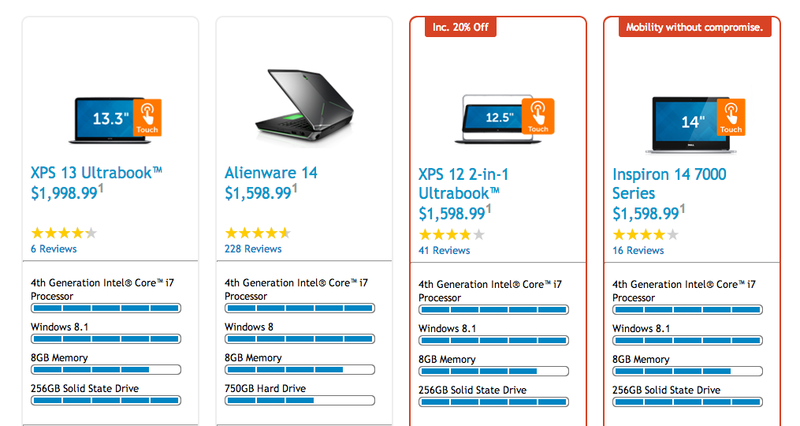 It’s sad to see how manufacturers are giving consumers a hard time just looking to find a laptop. It’s even sadder to see some manufacturers showing old models in their listings (Asus and Samsung). 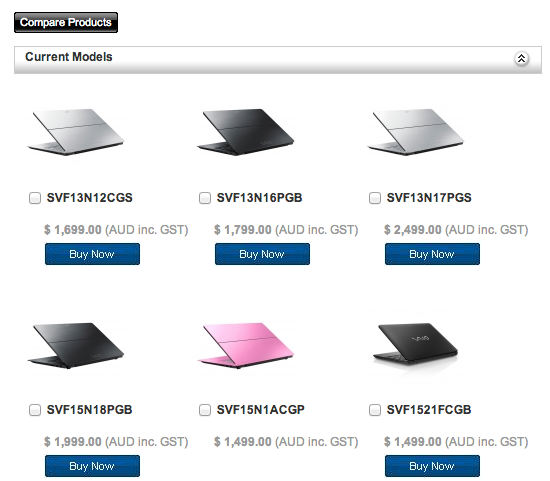 Kudos to Sony for simplifying their range to 4 distinct types of laptops but Apple takes the cake due to their minimal yet sufficient product line up and having information rich specification pages.